Our partners at Preferred Hotels & Resorts are pleased to offer Away by TTI Travel clients special amenities on the following properties. Castello di Casole is located on an historic 4,200 acre estate, in the heart of Tuscany. Centrally located to cities of Florence, Siena, San Gimignano and Volterra, surrounded by vineyards and olive groves. Anchored by a boutique 5-stars resort hotel and surrounded by 4 bedroom Farmhouses and 2/3 Bedroom Villas. Located in the heart of Lake Como, with unparalleled views of Bellagio, the iconic Grand Hotel Tremezzo is an authentic Art Nouveau palace offering the delights of a 5-star luxury vacation. With 76 rooms and 14 suites, including 8 hyper-exclusive Rooftop Suites, it offers an entire world of temptations: 3 breathtaking pools, sandy beach, private boat, the luxurious T Spa with exclusive ESPA treatments, 2-hectares lush secular park, tennis court and 5 different restaurants and bars offering the culinary art of Italy’s most famous chef, Gualtiero Marchesi. An Unsurpassable Alpine Experience! A new icon in the exclusive, discrete and cosmopolitan Swiss resort of Gstaad, The Alpina Gstaad five-star superior hotel has single-handedly redefined luxury and Alpine chic. This is no ordinary hotel, it is a unique establishment where authenticity combines with Swiss refinement to create an Alpine experience like no other. A jewel of the Swiss hotel industry, The Alpina Gstaad has been receiving outstanding distinctions since it opened in December 2012. Beyond The Expected. Nestled by the banks of the River Liffey, in the charming village of Straffan Co. Kildare, The Kildare Hotel, Spa and Country Club offers you the highest standards of comfort, service and cuisine. Located just 35minutes from Dublin’s International airport and Dublin’s City Centre it is the perfect escape for those looking to marry the idyllic Irish country retreat with all the iconic tourist attractions Dublin city has to offer. The Mark is housed, as it has always been, in the beautiful, 1927 landmark building at the corner of 77th Street and Madison Avenue in NYC. Newly-reborn, The Mark combines the luxury of old-world comfort, avant-garde design, up-to-the-minute technologies and an unprecedented level of personal service to create the finest five-star hotel of the 21st-century. Drawing on the expertise of an extraordinary group of talents — foremost among them the designer Jacques Grange and the hotel’s general manager Olivier Lordonnois — The Mark Hotel is now a beacon of high French style and modern American technology and comfort. 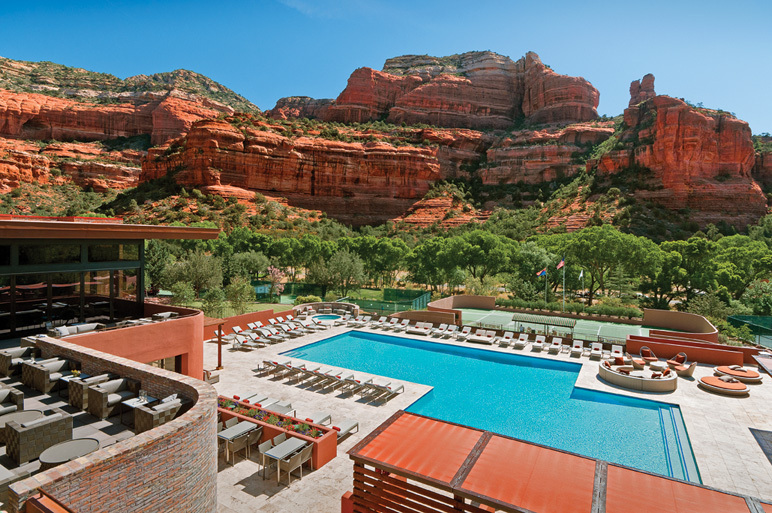 Surrounded by the towering red rock walls of Northern Arizona, Enchantment Resort combines the rugged grandeur of the Southwest landscape with equal parts luxury and Native American culture. The 70-acre resort is designed to take advantage of the breathtaking scenery with one-story adobe accommodations with private decks offering panoramic views. A wide variety of dining options plus exclusive access to a world class spa and private golf course complete the destination experience. Eau Palm Beach Resort & Spa is bringing new life to the Palm Beach experience. Offering a new style of effortless living on seven chic acres of oceanfront, lush tropical gardens and a whimsical twist on luxury inspired by its namesake Eau. Each guest room, an oasis, bringing a bit of “Santorini meets Capri, meets Palm Beach, “ and Eau Spa, a 42,000 square foot wonderland offers a sublime retreat, as named through Condé Nast’s Top 25 spas in the world. Montage Laguna Beach offers a seaside destination unlike any other, pairing extraordinary amenities with the genuine warmth of a cozy, Craftsman-style estate. It’s the ideal Southern California beach retreat, whether you’re seeking a restorative midweek or weekend vacation, planning a small to mid-size meeting, or hosting a romantic wedding reception. Bermuda’s premier cottage resort offers sanctuary for adults seeking a relaxing escape. Guests can indulge in a serene or romantic getaway with breathtaking panoramas of the Atlantic Ocean. Amenities, including 4 beaches, marina, spa, 3 restaurants, croquet and putting greens, tennis courts, moped rental, and indoor and outdoor swimming pools. Accommodations are provided in Bermuda-style cottages and customary afternoon tea is served in the historic main house. Early check-in or late check-out if available.